The 16 CT scanners that have been used for the current study are spread over eight major cities out of 13. 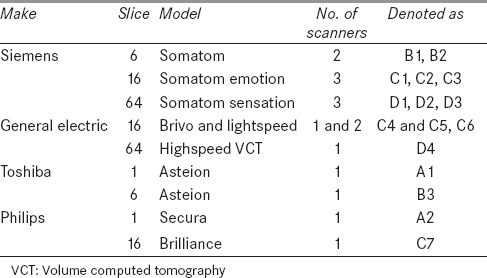 [Table 1] summarizes the make and model of the CT scanner used for this study. In each category of machine (i.e., A, B, C, and D) the lowest, highest, and mean operating parameters are presented in [Table 2]. Before carrying out the regional dose estimation, complete QA (electrical, mechanical, and radiation checks) were performed for all the machines involved in this work. One among these tests was the measurement of CTDI w for standard protocol involving tube potential of 80, 100, and 120 kV, tube current-time product of 100 mA and 5 mm slice thickness. These values were compared with the CTDI w displayed in the console to ensure that the radiation output from the machines were satisfactory. The CT dose indices were measured based on the five-point method proposed by European guidelines. Though the patient data abstraction has been done for 50 head, 50 chest, and 50 abdomen procedures per machine, the phantom study was carried out only for 20 head, 20 chest, and 20 abdomen procedures for each machine (total measurements 60 × 16 = 960). These 20 scan parameters per procedure per machine were selected by omitting the repetitions. The CTDI 100, c and CTDI 100, P was measured for the different tube voltage and tube current time product used for the respective CT scanners for the selected procedure. Using these values; CTDI w , CTDI v , and DLP were calculated. In each group of machine (i.e., A, B, C, and D) the lowest, highest, and mean CTDI v and DLP is presented in [Table 3]. The measured CTDI v and DLP were compared with the CTDI v and DLP obtained from the control console and is presented in [Figure 1] and [Figure 2]. 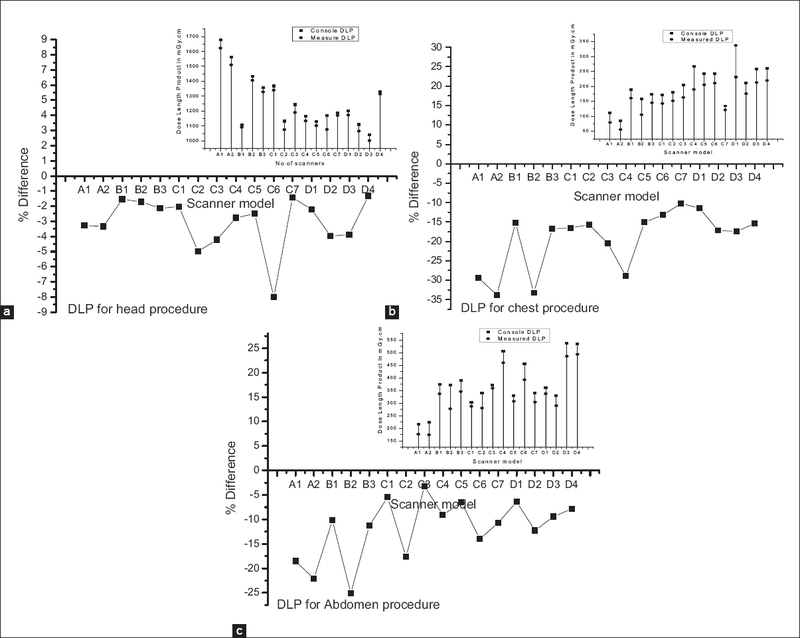 From [Figure 1] and [Figure 2], it can be noted that the percentage difference between the measured and console CTDI v and DLP for the head, chest, and abdomen procedure lies within the acceptable limits (expected ±20% and maximum ±40%) recommended by Atomic Energy Regulatory Board (AERB),  which is based on International Commission on Radiological Protection (ICRP) standards. This confirms that the CT scanner has delivered the optimized radiation dose to the patients. 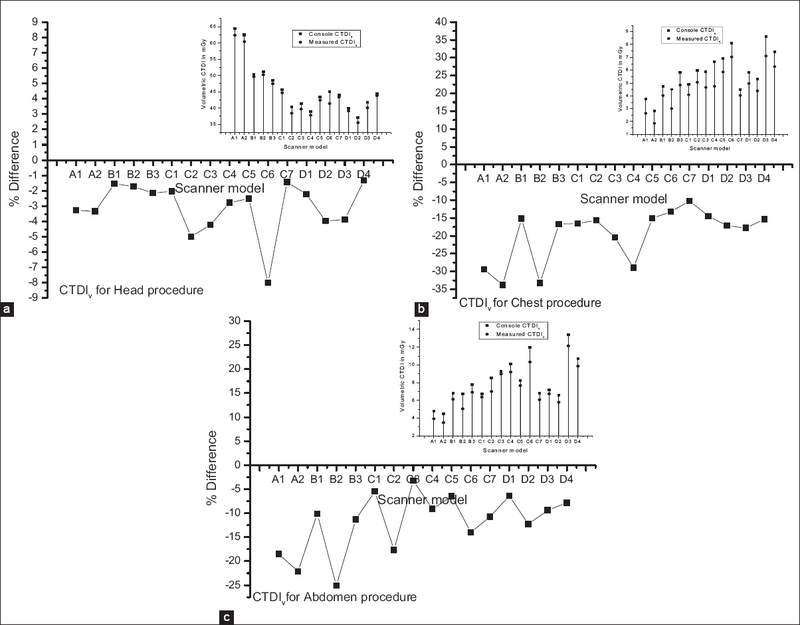 However, it can also be observed from [Figure 1] and [Figure 2] that the CTDI v and DLP for chest and abdomen procedures and the percentage difference between the measured and console CTDI v for certain machines is above ±20%. This may be ascribed to deviations from routine scan parameters viz. pitch, field of measurements, beam shaping filter, kV, slice thickness, slice collimation, acquisition, tube rotation, exposure time per rotation, scan mode, angular tube current modulation, longitudinal tube current modulation, and couch increment; and hence it is suggested that such CT scanners should undergo periodical quality assurance (QA). If these routine scan parameters for chest and abdomen procedures are optimized, then the dose indices could be brought down within the limits recommended by AERB, and this would lead to a good scan practice. The 75 th percentile point of the CTDI v and DLP distributions was calculated as the respective DRLs. The mean, range, and third quartile values are tabulated in [Table 4]. The DRL thus calculated for Kerala region has been compared with DRL proposed by European Commission (EC) , as they were the pioneers in this kind of study. The data presented in [Table 4] indicates that the DRL estimated for CTDI v for the CT scanners operating in Kerala is lower than the ones set by EC because average European adult patient size (density of the scan region) is more compared to Indian patients and hence the machine operating parameters used by the scanners operating in those countries are on the higher side. However, the DRL for DLP [Table 5] indicates that the value is higher when compared to ECs DRL. This may be attributed to longer scan length set for these machines. The radiographer has to customize it depending on the indications and it must be always controlled to the region of interest to avoid unnecessary radiation dose to the patients. It is important that the DRL has to be brought below the ECs DRL value at least in the following years, which can be achieved by choosing optimal scan length in accordance with various clinical indications. As far as chest and abdomen scans are concerned, acceptable scan parameters have been used. If all the radiological departments that are operating the CT scanners in Kerala try to maintain CTDI v and DLP lower than the one proposed as DRL, of course without compromising the image quality, it is sure that in the subsequent years, the dose distributions for the three procedures would narrow down and a more refined DRL could be achieved as obtained in other countries. This practice will surely ensure the optimal dose received by the patients, thus preventing them from receiving unnecessary radiation dose. This practice would also promote safety awareness among the radiographers. Saravanakumar A, Vaideki K, Govindarajan KN, Jayakumar S. Establishment of diagnostic reference levels in computed tomography for select procedures in Pudhuchery, India. J Med Phys 2014;39:50-5. Livingstone RS, Dinakaran PM. Radiation safety concerns and diagnostic reference levels for computed tomography scanners in Tamil Nadu. J Med Phy 2011;36:40-5. Cynthia H. McCollough, PhD Mayo Clinic, Rochester MN, Diagnostic Reference Levels, November 2010 Available from/WWW.IMAGEWISELY.ORG, American college of Radiology. [Last accessed on 2015 Mar 02]. Nationwide evaluation of X ray trends (N.E.X.T). Tabulation and graphical summary of 2000 survey of computed tomography. Available from: http://www.crcpd.org/PDF/NEXT2000 CTProl.pdf, 2007. [Last accessed on 2007 Feb]. Teunen D. The European Directive on health protection of individuals against the dangers of ionising radiation in relation to medical exposures (97/43/EURATOM). J Radiol Prot 1998;18:133-7. Bongartz G, Golding SJ, Jurik AG, Jurik, M. Leonardi, E. Van VP et al. European Guidelines for Multislice Computed Tomography. Funded by the European Commission. Contract number FIGM-CT2000-20078-CT-TIP, March; 2004. AERB/RSD/MDX-CT/QAR/2010, Acceptance/Performance test for Computed Tomography (CT) scanner; Available from: http://www.aerb.gov.in/cgi-bin/X-Ray/XRAYuserform.asp [Last accessed on 2015 May 08]. AAPM Computed Tomography Radiation Dose Education Slides, AAPM working group of standardization of CT Nomenclature and Protocols. Available from: http://www.aapm.org/pubs/CTProtocols/documents/CTTerminologyLexicon.pdf [Last accessed on 2013 Nov 18].